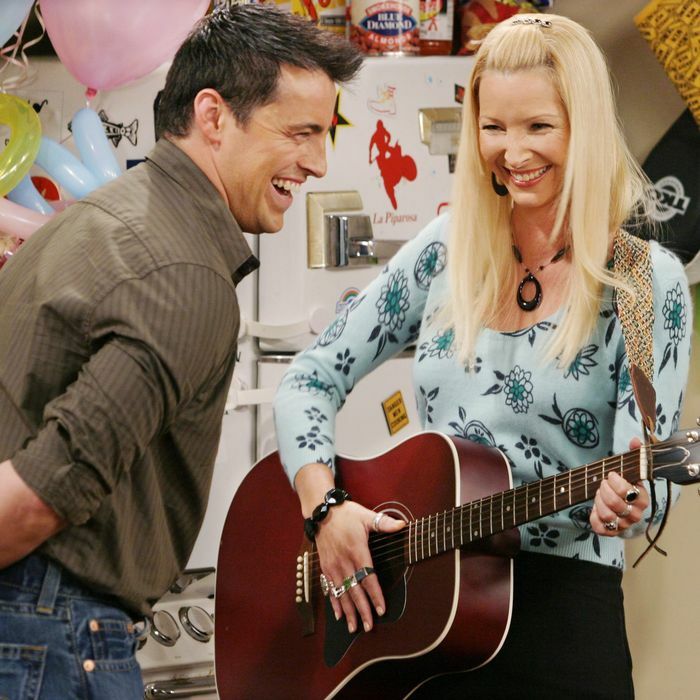 Phoebe plays Nurse Lisa and Lisa (Kudrow) can’t stop laughing. Joey’s pep talk was a bit too much for her. Monica and Chandler break the fourth wall. A lot. Matt Perry: Actually funny in real life! Or the scene where the child star playing Ben can’t act. You’re not supposed to be able to talk yet, you adorable thing! Matt LeBlanc is a mensch. The very famous “pivot” scene took quite a bit of work. Schwimmer cracks under the weight. Again and again and again. Remember when Ross played a bagpipe? I bet David Schwimmer does. Danny DeVito takes Jen Aniston’s paycheck. Never forget who your friends are, Jen. And Matt Perry has a mustache. That’s not a blooper. The One With All the Bromance. Cut to 1:14 for the cutest interaction between LeBlanc and Schwimmer. Courtney Cox gets a new nickname. Start at 1:50 to hear it. Jennifer Coolidge is on the receiving end of an A+ blooper. Wait, what accent is that?